“Why did you come to work today?” The answer to this question may be indicative of your commitment to the organization where you work, team or manager. Each employee has their own motivation for wanting to work in a particular career or for a particular company. Each employee also has their own motivation for staying in a particular career or at a particular company, with their team–or their manager. If they stay even when things get hard or inconvenient, we might call this commitment. Some people are committed to their job because they love what they do or their internal purpose aligns with the company purpose. Others stay out of a sense of obligation to their peers, manager or to the company. Yet others stick it out because they perceive their alternatives as less desirable than the present situation. In your own stomach, you can probably feel that some of these reasons to stay in a job can have a negative impact on a person’s attitude and well-being. How can you help the team members find more of the positive reasons to be committed to your team? Affective commitment: Affection for your job stems from a strong emotional attachment to the purpose of the work that you do. General alignment of purpose and satisfaction with the specific activities of a role amplify affective commitment. It is self-perpetuating. Employees want to work for you. 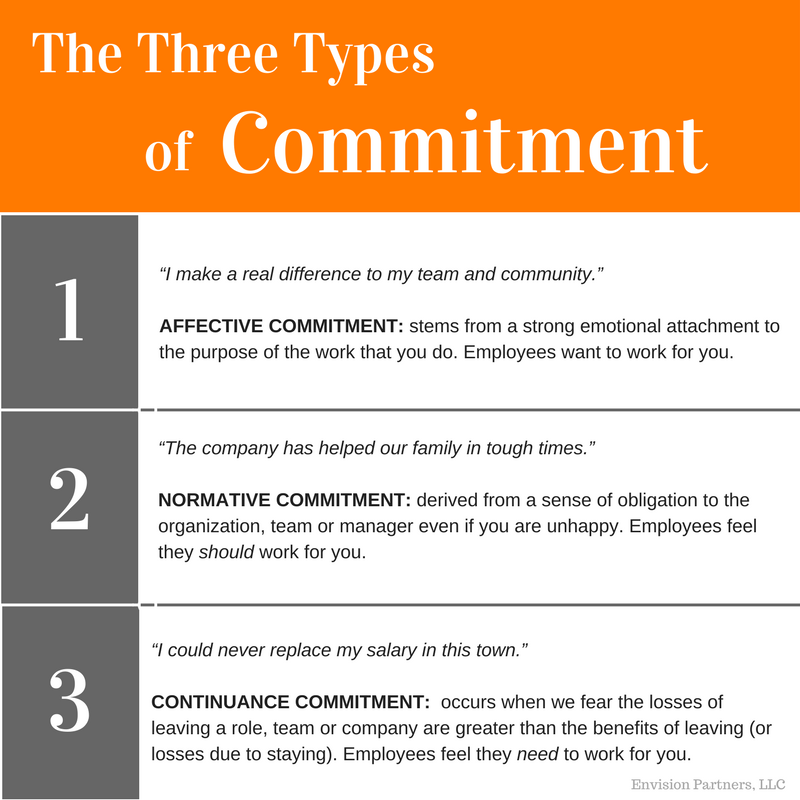 Normative commitment: This type of commitment is derived from a sense of obligation to the organization, team or manager even if you are unhappy. This form of commitment is about the impact a change would have on others. This kind of loyalty might result from personal values or a perceived debt to ‘pay-back’ an investment in training or other opportunities given by the organization. They might also feel guilty about leaving because they would make more work for other employees or believe no one else knows how to do their job. Employees feel they should work for you. Continuance commitment: A different form of commitment occurs when we fear the losses of leaving a role, team or company are greater than the benefits of leaving (or losses due to staying). This form of commitment often grows with years of service, promotions and pay-increases. Employees feel they need to work for you. There is nothing wrong with any one of these forms of commitment. They all occur at different times and in different amounts to carry us through the day, week or years. Sometimes we really don’t like (affective) a task, but are committed to completing it due to a sense of obligation (normative). We can then get back to something we like (affective). When forms of commitment are not in proper equilibrium for too long, employee engagement–attitude and desired behavior–can plummet. Imagine someone so loyal (normative) to a team that they sacrifice their own career advancement (continuance) or enjoyment (affective). At some point, you can imagine they can find this choice unacceptable and develop a bitter attitude. As a manager, we can inadvertently use one or more pressure points to ensure commitment when we hit those rough spots. If overused, we can create an imbalance that leads to reduced engagement or poor attitude. In several formal studies, affective commitment has been strongly correlated with employee engagement and behaviors that support organizational goals (e.g. showing up to work on time, over-all productivity). Results, and instinct, suggest managers should do what they can to promote affective commitment by linking individual’s goals with those of the team or organization, and matching interests and skills to the job role. An overall positive work environment increases affective commitment without specific effort. Using the threat of unemployment as a first line of encouraging commitment is a poor use of continuance commitment– it’s poor management. However, more subtle manager activities, such as reward systems (if you do this then I’ll do this for you), may give the perception of lack of choice. Continuance commitment can promote increased buy-in in the short term, but a constant reliance on this method is correlated with negative consequences of increased employee expectation of benefits, for example. Many managers unknowingly rely on normative commitment. In many cultures, there tends to be a strong loyalty to the organization for the mere opportunity to be employed. We don’t want to reduce this loyalty, but we do not want to expect it to carry an employee through the difficult times. We should not be surprised when loyalty alone is not enough to retain employees. In my experience, it is not the managers who overuse normative and continuance commitment. Rather, the employees self-apply enough normative and continuance commitment that they tend to not take care of themselves in difficult situations. For example, they will passively accept role and task assignments—and in the end–are unhappy and unhealthy. Managers should try not tap into these forms of commitment and be aware of this tendency of employees to overuse them. Use your energy to build affective commitment, and consider continuance and normative commitment as short-term fillers.